R. Derwin Clothiers, a mainstay business on West Street, will soon sell its men’s and women’s clothing under one roof. The women’s store will be moved up the block to the space next to the men’s store at 43 West St., with a soft opening planned for Labor Day weekend. The business has a history of changing to suit the needs and opportunities of the moment, store manager Jonathan Wilson said this week. Richard Derwin opened the store more than 25 years ago, Wilson said, featuring both men’s and women’s fashions in the building that is now occupied by DiFranco’s restaurant. It moved along the Green soon thereafter, taking up residence at 33 West St. — the home of the women’s store. The family adjusted over the years as the business grew, he said — the store expanded to the second floor of 33 West St., divided into men’s and women’s stores about a decade ago, then settled into its current configuration in recent years. Wilson’s mother, Andrea Derwin, has seen that change take place first-hand. She began running the women’s store more than 20 years ago, she said Tuesday, and is excited to move into the new space, which is significantly larger than the current location. “It’s going to be light and bright and airy and fresh and new — and exciting. We’re very excited about it,” said Derwin. 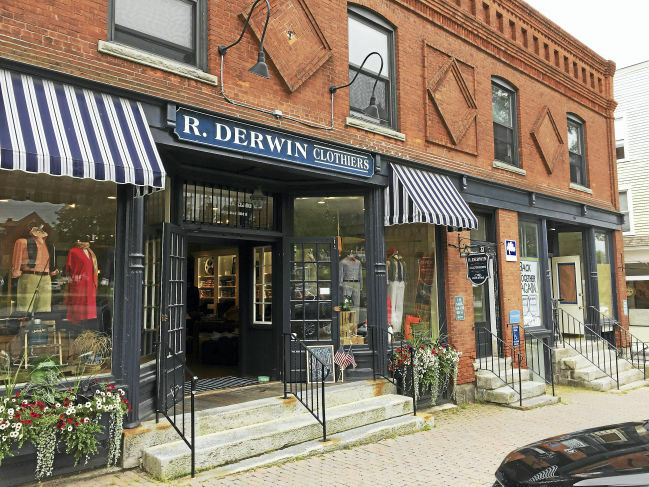 Derwin’s is known for its traditional men’s and women’s clothing — custom-made shirts and trousers, socks and of course, a colorful palette of sweaters and jackets that change with the seasons. 33 WEST STREET, LITCHFIELD, CONN.